No parking, no crowds, no hassle. 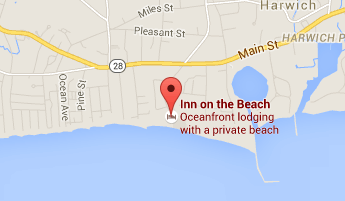 The waters of Nantucket Sound are yards from your room. Our diverse range of rooms offers choice and value for romantic couples, families or friends. 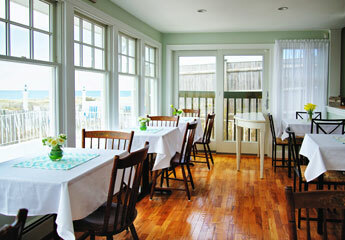 Enjoy your continental breakfast in our new lounge overlooking Nantucket sound. 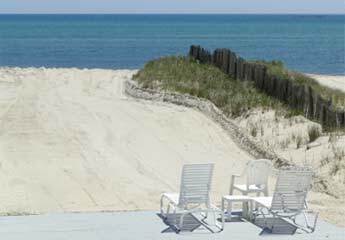 Inn on the Beach, a beautifully situated Cape Cod inn perched directly on the waterfront beach located in Harwich Port, Massachusetts invites our guests to rest and relax upon the inn’s shore. Soak in the sun drenched sands, the refreshing southwest breeze, and the warm waters of Nantucket Sound as you as you awaken to the gentle murmur of the waves as they lap upon the shore. We are pleased to offer our guests the final phase of our upgraded units and guest lounge. We believe all will be pleased once again as me move forward with bringing this gem of a property to where we believe families will find solace and comfort. For your enjoyment we offer additional seating areas on the lower deck where one can enjoy a warming fire with a glass of wine or perhaps order take out lunch or dinner to enjoy on the deck for your waterfront dining experience. The inn’s location, although ocean front, is just a short 5 minute stroll to the village of Harwich Port with its quaint shops and award winning restaurants.